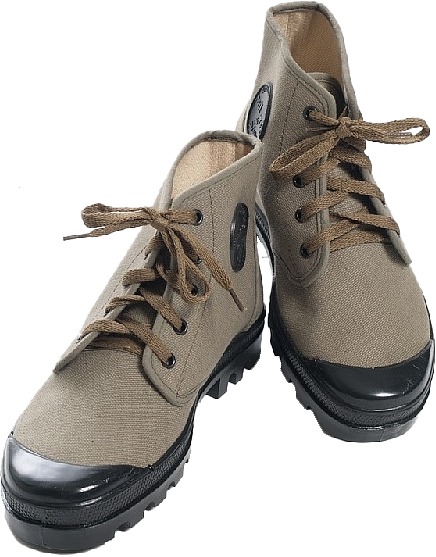 This leads to a more or less logical explanation for this: the authors of the Israeli "clones" wanted to bring a unique element in the copies they produced, and to "write down" the Hebrew letters of their logo ("daled" and "nun") in the tread pattern of the heels. 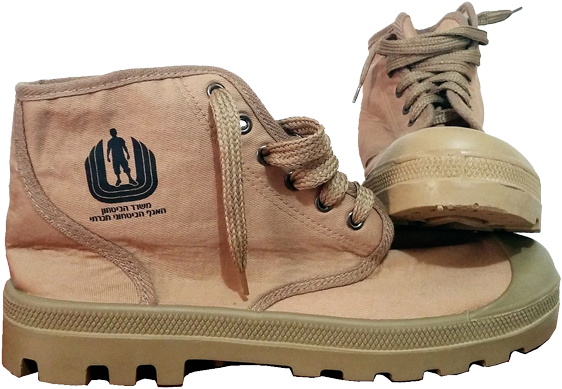 The photo above shows the examples of the Israeli version of "Palladium" canvas boots labeled in Hebrew. Black lower version of "Pampa" boots feature labeled protective round-shaped rubber pads with the inscription "SCOUT" and "Fleur de Lys", the French heraldic symbol. 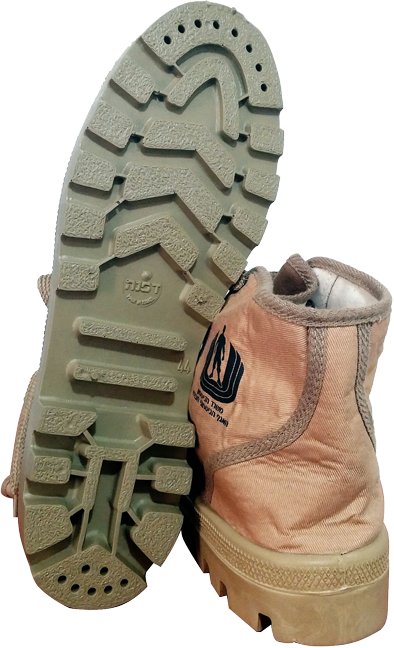 For visual comparison there are also presented the tread soles patterns of the Israeli-made "clones" (gray and olive) against the original "Palladium" (black and beige), and one can note the clearly visible differences between the tread patterns of the heels. One can also assume that this peculiarities may be related to the tread copyrights, which indirectly confirms similar example with the "Mil-TEC" company, which produces, in particular, the significantly deteriorated copies of the US military "jungle boots", but, for some reason, the tread patterns on the heels of the left and right boots were mutually swapped. 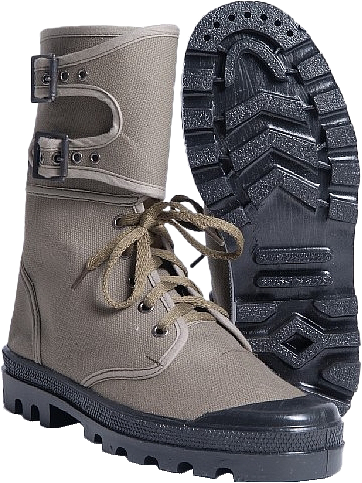 This appears to be a real nonsense, since the original American "jungle boots" feature massive and the strongest part of the heel pattern exactly on the places of the most serious load, with a high degree of tear-and-wear. In the fakes by "Mil-TEC" (aka "Teesar Inc.", Cartersville, GA, for the American market) the tread pattern shows deep hollows on the areas of the heels where serious mechanical load is usually applied, so the heels wear out very quickly on these points, and soon look like punctured and deflated tires. However, these fakes are not designed for long comfortable wear, and by the time the heel wears to this extent, the leather top starts to tear at the backdrop junction with the heel. From the very beginning the "Pataugas" were "low", i.e. "high" canvas and rubber boots with the gaiter and buckles didn't come around in Indochina or Algeria until the early 70's. "Palladium" is producing the same exact boot hat they were in 1947, except for the insole and some minor details of the out-sole tread pattern. "Palladium" boots are no longer manufactured in France, but like most modern footwear are China- made. 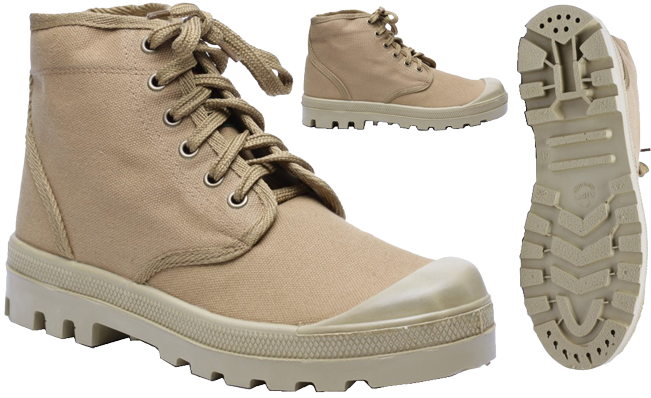 These "Palladiums" are obviously more "heavy duty" and better fitting than the Israeli copies. "Palladium" is definitely very proud of their brand name, and they use to place their tag on four locations of each boot exterior. One is on each tongue of the boot; another tag is placed just below the laces, being stitched into the outside seam side of each upper; the third none is placed on the bottom of the sole; and the last one is on the protective round-shaped ankle patch of rubber, as it was done originally, albeit in a different styles. On the inner side of each boot there is also an interior printed tag, with bar-code, manufacturer's code and size, and the inscription "Made in China".